Congratulations to forum-goers bengoshi, skinnydragon, and Wonderboy 2402! By leaving reviews of Beamdog and our products, they’ve won a Baldur’s Gate II: Enhanced Edition t-shirt, a copy of R.A. Salvatore’s The Crystal Shard, and a copy of the 5th edition D&D Starter Set! We’d like to thank everyone who participated by leaving a review for one of our games. Keep an eye on the Beamblog for more contests coming up this year. 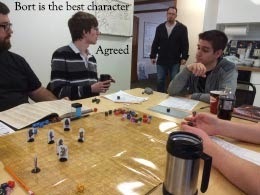 Here in the Beamdog office we’ve started our own 5th edition Dungeons & Dragons tabletop game. Some of our crew has never played a real tabletop session before and we thought this would be a good way to familiarize ourselves with the 5th edition rules. Amber, aka the BeamBard, took on the mantle of Dungeon Master but has yet to kill any of our characters. Not for lack of trying, though. In the two sessions we’ve had so far she’s thrown stirges, will-o’wisps, bandits, shadows, and gargoyles at us. Despite that, our little band of somewhat questionable heroes has persevered. In time we hope to live stream our D&D sessions, but until then you can read recaps and player notes on the forum thread. Share your thoughts about the contest, suggest future contest ideas, or comment on our game on the forums. You can also tweet us at @Beamdoginc.